Innovation is what sets us apart, and defines our commitment to excellence. From our values, to our approach, to our quality, everything we do is created with the notion that who we are and what we do, makes a difference in the biomedical industry. Biobanks stores genetic material and information used in research projects i.e. a key part of the infrastructure supporting genetics and genomics research. As the importance of samples and data has grown in research, and as genomics research attempts to analyse ever expanding data sets, biobanks are becoming larger and more prospective. Goldstein Research analyst forecast the Biobanking Market size is set to reach USD 2.83 billion by 2024, at a CAGR of 7.5% over the forecast years. The report covers the present ground scenario and the future growth prospects of the Biobanking Market for 2016-2024 along with its penetration in all the verticals and its future aspects in other fields as well. We calculated the market size and revenue share on the basis of revenue generated from major players across the globe. On the basis of sample type, blood products are projected to command the largest market share of 47.5% in 2016 due to the rising incidence of blood disorders and the increasing demand for various types of blood products. While on the basis of application, regenerative medicine tends to be the lucrative market in global biobanking market and will grow at the CAGR of 7.6% over the forecast period. Biobanking Market Outlook 2016-2024, has been prepared based on an in-depth market analysis from industry experts. The report covers the competitive landscape and current position of major players in the global biobanking market. The report also includes porter’s five force model, SWOT analysis, company profiling, business strategies of market players and their business models. Global Biobanking market report also recognizes value chain analysis to understand the cost differentiation to provide competitive advantage to the existing and new entry players. 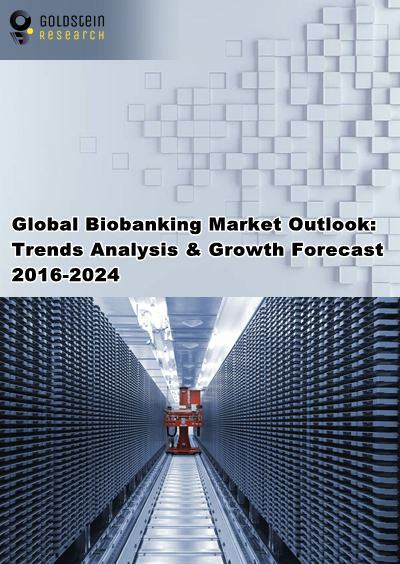 Our global biobanking market report comprises of the following companies as the key players: Thermo Fisher Scientific Inc., Tecan Group Ltd. , Qiagen N.V., Hamilton Company, Brooks Automation, TTP Labtech Ltd, VWR Corporation, Promega Corporation, Worthington Industries, Chart Industries), Becton, Dickinson and Company, Merck KGaA, Micronic, LVL Technologies GmbH & Co. KG, Panasonic Healthcare Holdings Co. Ltd, Greiner Bio One, Biokryo GmbH, Biobank AS, Biorep Technologies Inc., Cell & Co Bioservices, RUCDR infinite biologics, Modul-Bio, CSols Ltd, Ziath, and LabVantage Solutions Inc. According to the report, major driving factor for Biobanking market is the poor productivity rate of the pharmaceutical industry with respect to the new drug approvals is impacting the biobanking market as it requires biobanks for developing new drugs. In addition, availability of repository information management systems and online catalogs with annotation of samples tends to drive the market of biobanking. Further, the report states that the major challenge is regulation-based issues with biobanking procedures and fear of privatization as the practice and rules for obtaining informed consent for the scientific research require improvement. Based on geography, North America is leading the Biobanking market with the market share of 45% in 2016. Europe is the second largest market but largest biorepositories market due to the huge demand from the Netherlands, Italy, Germany, the U.K., and among other countries for Biobanking though increasing number of biobanks in Europe and worldwide requires integration and regulations while APAC is anticipated to have the highest market share by 2024 due to its increasing demand in regenerative medicine. What is the revenue of Biobanking in 2015-16 and what would be the expected demand over the forecast period? 7.2.1. Thermo Fisher Scientific Inc.